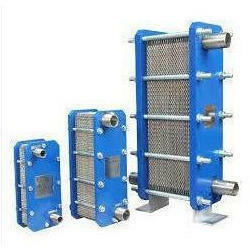 Pioneers in the industry, we offer plate heat exchangers from India. In line with clients' variegated requirements, we bring forth a distinguished collection of Plate Heat Exchangers that are mainly used for cooling purpose. These exchangers are designed at our ultra-modern manufacturing unit using the superb quality material and progressive technology in conformance with defined quality standards. Being a quality-oriented organization, we assure our clients that these exchangers are excellent on counts of durability and quality.